Add 4 eggs, one at a time, slowly mixing through. Sift in 225g flour, then add the finely grated zest of 2 lemons and mix until well combined. 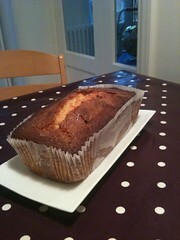 Line a loaf tin (8 x 21cm) with greaseproof paper (or, easier, use a cake tin liner), then spoon in the mixture. Bake for 45-50 minutes until a thin skewer inserted into the centre of the cake comes out clean. While the cake is cooling in its tin, mix together the juice of 2 lemons and 50g caster sugar to make the drizzle. Prick the warm cake all over with a skewer or fork, then pour over the drizzle - the juice will sink in and the sugar will form a lovely, crisp topping. Will keep in an airtight container for 3-4 days, or freeze for up to 1 month.